adidas has announced the upcoming launch of the new adiZero cycling jersey, the lightest top ever to be released to market. Weighing in at a mere 65g the adiZero is made from lightweight mesh materials (in �solar blue�), which both reduces weight and allows for rapid moisture transfer, whilst a more open mesh is employed in panels for added breathability. �Ultra-stretchable� material has been integrated around the arms and shoulders for comfort, fit and flex on the ride and a windproof chest panel is used to hold back the cold on those rapid downhills. 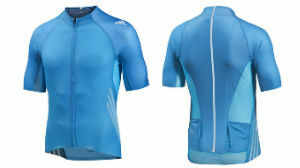 Noted for its �aerodynamic genius� by judges, the adiZero jersey was Winner of the prestigious Gold Eurobike award in 2013 for Apparel and the British Cycling version has been used extensively by the team during elite competition, and will be worn in upcoming international road competitions. In part this pro-cycling feedback has been used to fine-tune the adiZero. The adidas adiZero cycling jersey will be available from June 1 and will retail at �120.